Ramallah city was the first Palestinian city and the third city in the Arab region and among the first 33 cities worldwide in 2014 to join an international Network called “100 Resilient Cities” pioneered by The Rockefeller Foundation. Throughout the development process of Ramallah Resilience strategy 2050, a wide range of stakeholders had participated in shaping Ramallah2050 vision, three strategic directions, 11 goals and 37 interventions – a strategy hierarchy - aiming at preparing the city systems to adapt, recover and grow when mitigating the predicted and unpredicted shocks and stresses, such as: traffic jam, severe weather conditions, control over the land and mobility by Israeli occupation and possible earthquakes. The release of Ramallah Resilience Strategy 2050 marks a new way of looking at urban development as an integrated, holistic and interconnected sectors while involving majority of development sectors at city and national levels. 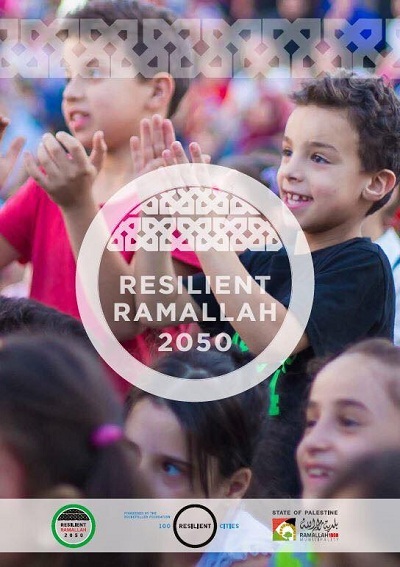 Ramallah Resilience Strategy 2050, has developed a clear vision for 2050, where Ramallites see their future city as “optimistic, sustainable, inclusive and proud of its culture and in control of its own destiny”. Ramallah 2050 vision will be achieved by implementing 37 actions, which foster responsive governance, realize city’s great potentials, and decrease its dependence on others. Ramallah 2050 vision is aligned with collective international resilience movement, as well as, the Palestinian national agenda “citizens come first”. Ramallah municipality with partners in the city and surrounding areas, will lead the implementation of the resilience strategy, and forge a real partnership with all relevant sectors at different levels.